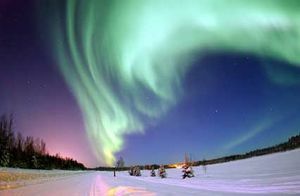 Is the Aurora Borealis really worth ten billion Euro? HAMMERFEST, Norway -- This morning, Norwegian Prime Minister Kristin Halvorsen announced that Norway could not afford to continue running the forty-four million LEDs that produce the Northern Lights. 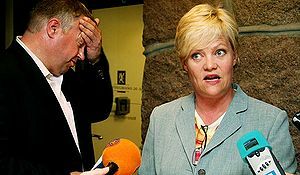 In an press conference this morning, Ms. Halvorsen stated that the nation "simply couldn't afford it any more" and that the estimated ten billion Euros that it costs to keep the lights running would be "better spent on things like education and a new 'super-casino.'" However, a rumour has it that Ms. Halvorsen actually intends to use the money to buy herself a new super yacht, a Scottish Castle and the Manchester City football club. Kristin Halvorsen next to her body guard, who took a mercury bottle to the face for his country. When asked directly about these rumours, Ms. Halvorsen replied, "Rumours are still illegal in this country." After that, press members began pelting the Norwegian leader with water bottles, half full (or empty) with mercury from the Government mining facility that was recently closed down for similar reasons. Body guards stepped in and diffused the situation shortly afterwards, with many arrests being made. At the moment, there has been no information released about the true state of Norway's economy, however, leading economists believe that it could be as much as one hundred and seventeen Euros in debt. The National Treasury had nothing to say about this. If the state of the nation's economy continues to decline, Norway may be forced to exit the Euro zone. Such events could crash Finland and Denmark's economy, which would greatly hamper the Euro. Which begs the question, 'Is the Euro zone doomed?' Probably not. The economy isn't the only national entity experiencing mayhem because of the shock announcement. Many devastated tourists began protesting only a few minutes ago in Hammerfest, where the big red On switch is located. Along side them, all eighteen Norwegian University students are banding together to help defeat Ms. Halvorsen in a peaceful manner. National Servicemen are at the scene to ensure things do not get out of hand. However, based on the beer capacity of the local pub, this valiant display can probably only continue for another seven hours. University will reopen in two days. Once again, Germany could provide the answer to this catastrophe. The European superpower has offered to purchase the lights and have them moved to Berlin, where they will be upgraded to display HDTV off the North Coast of Germany. A spokesperson for the German government even went as far as to suggest that if all goes well, there may even be a second and third Aurora over the English Channel and the Mediterranean Sea. However, viewers in Britain and Africa will have to wear special glasses that mirror the image, otherwise, it may be too difficult to watch the reverse side of the screen. The aurora borealis will be officially turned off on July 26, so that tourists will get to experience one final glimpse of the Scandinavian version of the Northern Lights on the national holiday, Christmas in July. Tickets are on sale now. This page was last edited on 19 December 2013, at 03:15.